Jimmy Feigen remains in Rio and could still be arrested, while Lochte's whereabouts in the U.S. are unknown. The Great #LochteGate of 2016 continues: In addition to police confirming they believed Ryan Lochte and his USA teammates fabricated the ongoing story of them being robbed at gunpoint in Rio, said teammates have now told police that Lochte was the one to come up with the tale, SportsCenter confirmed. According to ESPN, it was Jack Conger and Gunnar Bentz—both of whom are currently detained in Rio along with Jimmy Feigen—who told on Lochte to the police. It is now believed the entire story originated when the swimmers broke the door of a gas station restroom they were trying to get into and, when a confrontation with the station's security guard got heated, paid the station's manager the equivalent of $50 in cash as reparation. They soon after left. Per surveillance footage obtained by TMZ, the confrontation appears to have happened after the swimmers got into their taxi to leave, which may have been where Lochte originally got the whole men-approached-our-taxi-with-badges-and-guns thing. Lochte remains safely in the U.S. as his teammates are detained in Rio. There has been no further update from him on the alleged incident or the execution of his hair plans from earlier this week. My hair is going back to its normal color tomorrow ???? Update 8/18, 4:01 p.m.: It turns out Lochte may not have lied about the incident so much as he exaggerated some details and omitted others. A security guard, not a police officer, did brandish a gun at the swimmers during the altercation at the gas station, the New York Times reports. Still, Brazilian authorities insist there was no theft that night. Lochte sources insisted to TMZ the swimmer was not lying but that there are three minutes missing from the released surveillance footage that back up almost all of the swimmers' claims. The same sources said earlier reports that Lochte's teammates Conger and Bentz told police the story was Lochte's lie are also false. Regardless of the outcome, CNN reports this isn't a crime any of the athletes will be arrested for. Civil Police Chief Fernando Veloso said in a press conference: "In theory, one or all of them might be charged for false communication of a crime and for damaging private assets, the gas station. I'm not saying that they are charged right now because of that. We have to finalize the investigation and in theory that could be the case." The penalty would also not likely require the detained swimmers to stay in Rio. 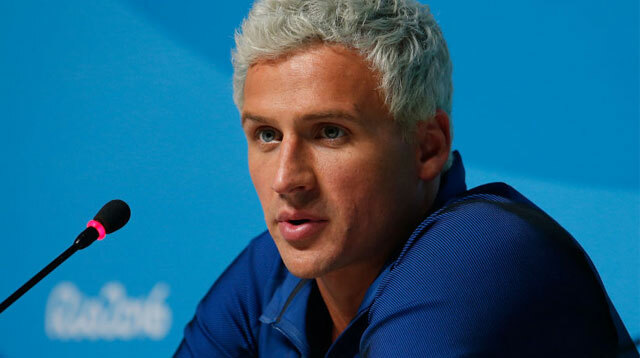 Update 8/18, 5:31 p.m.: Reuters reports Brazilian police are officially recommending charges be filed against Lochte and Feigen for falsely reporting a crime. It's unclear if they also recommended charging Bentz and Conger, who have been allowed finally to leave the Rio police station after giving testimonies. Update 8/18, 6:20 p.m.: Lochte and Feigen have been officially indicted of falsely reporting a crime, Brazilian authorities confirm. Feigen remains in Rio and could still be arrested, while Lochte's whereabouts in the U.S. are unknown. According to TMZ, this is a crime punishable by up to six months of jail time.